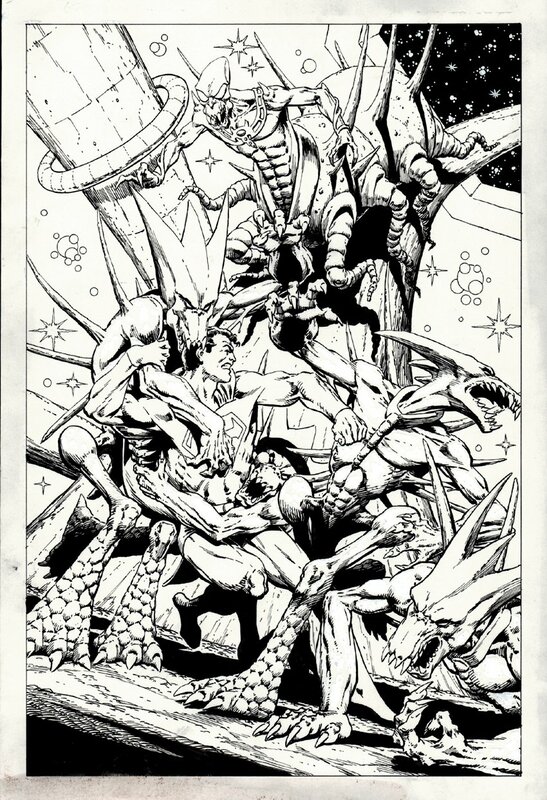 Check out this very nicely detailed Pinup / poster art, which was penciled and inked (NO MARKER) by the great Jim Starlin! This stunning Pinup features a nice large image of Superman battling 4 crazy looking 4 legged creatures that look like they are part Pterodactyl Part lizard and part bug! The background inking structure and the outer space scene are as detailed as the stunning figures drawn! Actual drawn Art area measures 8.75 by 13.2 inches on bigger art board! Just a neat piece! ALL art on our website (including this one) are able to be purchased with VERY fair time payments, and trades are always considered towards "ANY" art on our website! Just send us an email to mikeburkey@aol.com and we can try to work something out.